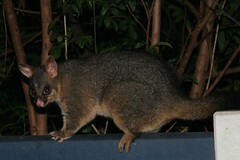 This little visitor decided to visit us at night and scavenge left over food from our deck. We’ve sometimes caught them grabbing pieces of birthday cake when no one was looking. Those eyes look almost like LED’s don’t they?